These Farm Heroes level 414 cheats and tips will help you beat level 414 of Farm Heroes. 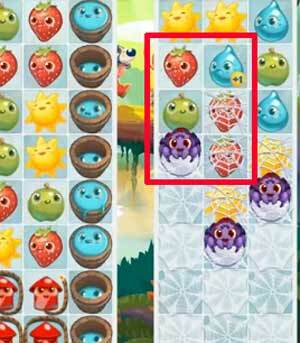 The objective of Farm Heroes level 414 is to reach 100% growth by collecting 100 water drops and 3 spiders in 25 moves. For the first time in many, many levels, you only have one basic cropsie to focus on! There’s a trade-off, of course: the board is split once more into two. All three spiders you need to collect are over on the right board, and they have nine whole backup webs to use before you can collect them. You’ll need to chase them all the way to the bottom. Start off the level by looking for vertical matches to make next to water buckets. Water droplets will not fall onto the board naturally, so you’ll have to create your own. Fill the buckets as quickly as you can. 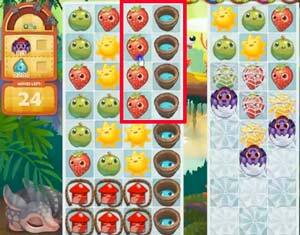 Once you start forcing water onto the board, it will begin to match with itself, so you won’t need to make extra matches to get to 100. If you just keep making matches next to the buckets, the water will take care of itself. Luckily, creating cascades is extremely simple in this level. There are only three type of cropsies that will enter the board naturally, so making big matches will allow lots of the same cropsies to fall onto the board, which will make more matches in turn next to the buckets. Water by itself can’t help you burrow into the webs next door. You’ll need to look for ways to make that happen on your own at first. When the level starts, immediately look for cropsies to match with one another to destroy webs and expose the spiders. You’ll need to make two matches next to a spider–the first to destroy a web next to it, and the next to drive it backward. You can avoid making one of these matches by using a magic shovel booster. It would be wisest to use the shovel to remove webs, as matches after this will be much easier to make. Remember that the spiders will re-web everything next to them after running away, so don’t worry about clearing everything out every time–you’ll just waste moves. Once you make enough space in the right side of Farm Heroes Saga level 414, you can begin filling it with water. This will create cascades much as it will in the left side of the board, speeding up the process of driving back the spiders. Level 414 Cheat #3: Use the firecrackers. The quickest way to destroy lots of web squares at once is by using the firecrackers. These will spray fire over the right side of the board and expose the spiders. Of course, you can’t rely on the firecrackers too much. They’re just as likely to remove cropsies from the left side of the screen as to blow up the webs. Prime the right side by using several firecrackers to expose multiple spiders, then make a match or two to drive them back simultaneously.